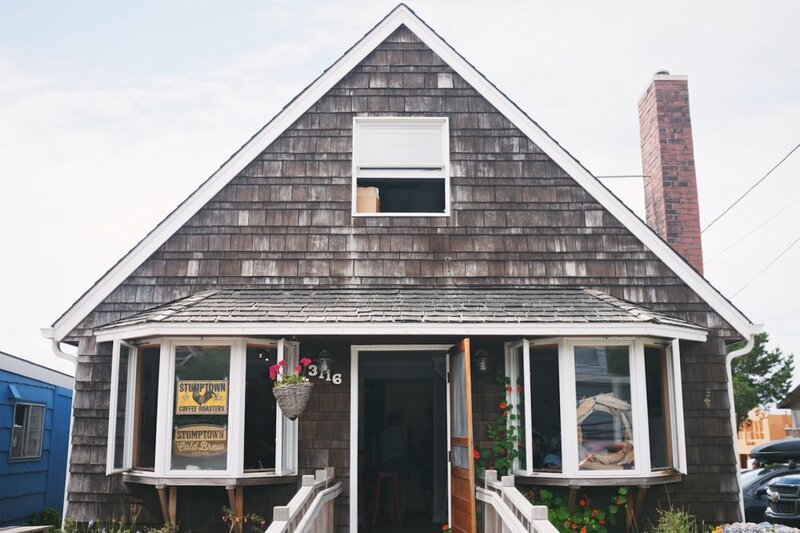 What writer doesn't dream of holing up in a little beachside cottage to finish their next novel? I live and work in the city of Portland which means when its time to find some spacious solitude while getting things done, Cannon Beach tops my list. Sea Level Bakery is a cottage-style coffee house located a few strategic blocks from the beach just south of the downtown shops and off the 101. It's the perfect spot to get some work done while enjoying an Acai bowl towering with fruit. A hand-crafted cup of Heart coffee served with a miniature spoon is what makes this place my number one. The Cappuccino is my usual order, but every drink I've had here is exceptional. All syrups are all made from scratch. And the bread. I can't even describe it. While seating is sparse and in high-demand during peak hours (usually 11-2pm on weekends) I can always seem to squeeze in a spot at the bar along the window (pictured) or at one of the outdoor picnic tables. Fair warning, it's not the best spot to camp out all day if you're looking for something comfortable, but I've been able to get a few hours and then stash work away for a nice solo beach stroll. If you happen upon this place with a full stomach, take a pastry to go, one for you, one for your dog, one for the beach. Just take one, and tell your friends. Or don't. I'm surprised I'm even telling you. Every writer has the old standby in their back pocket when they need to disappear for a few hours, and this one is mine. I prefer Sisters on a rainy Saturday morning when I feel like being indoors. Comfy leather furniture and balcony seating frame this Lodge-inspired space, complete with antler taxidermy and an antique piano. My recommendation is to go early in the morning before it fills up and seek out a four hour parking spot on one of the adjacent cross streets so you don't have to worry about rushing back to plug the meter. Does Sisters have the best coffee in downtown Portland? Probably not. But the space is hard to beat, and it's in a less busy area of town where it's easier to park than parts of Northwest or Southeast. The baristas are always nice. Sisters Coffee is place I love for its consistency. And the view from the balcony-level is hard to beat. The Columbia Gorge is a passageway that makes even hardened locals swoon. It's majestic cliffs and cascading waterfalls are a retreat that reminds every traffic-weary resident why they live in Oregon. And the picturesque hour-long drive is exactly the kind of thing to get your creative juices flowing. Hood River is a playground for outdoor junkies. With breweries every block and fruit orchards as far as the eye can see, there's plenty to do outside the city for a day. Stoked is located on the Hood River Waterfront park between a wood-fired oven pizzeria and a gelato cart. Windsurfers like to catch their breath here from the tempest Gorge winds. Public parking is free and ample, making this a great spot to meet friends before a hike or as a road trip destination. If you're lacking inspiration, a walk down to the water to watch the colorful sails darting back and forth across the channel makes the drive alone worth it. The bar setup along the big front windows provides plenty of space and outlets for laptops, and the people watching is an unforeseen benefit. The drink menu supplies anything from matcha lattes to flat whites and the staff keeps outdoor magazines on hand to browse over an espresso. It feels like the kind of place you'd spot Alex Honnold before disappearing into his adventure van.